I’m delighted to have Mercedes from Surfing to Success here today sharing a FANTASTIC post on Success Criteria. You want to read this one through! We all set clear objectives but do students know what it means to successfully meet those objectives? That is where success criteria come in. Traditionally, teachers are the keepers of success. We issue a grade that lets students know they were successful. How many times have you turned in a paper and wondered what your grade would be? Chances are you weren’t given clear success criteria. Success Criteria look very different with different objectives. If the objective is to write a descriptive paragraph, the success criteria could be a student friendly rubric and an example paragraph. If the objective is to fluently multiply within 100, the success criteria could range from answering a fact within 3 seconds, to multiplying without manipulatives, to getting 100% on a timed test. I’m Mercedes Hutchens from Surfing to Success. I teach Kindergarten through Sixth Grade Intervention so my success criteria vary greatly throughout my day. For upper grade math, my criteria are consistent. Students need to get 100% on a two problem quiz to demonstrate success. When planning I create two versions of the simple assessment. When students walk in on the first day, I share the objective. Often students believe they can already demonstrate success, so I give them a pretest. Sometimes there are kids who get 100% right away. I give those kids the option to stay and practice the rest of the week. The power in the success criteria comes for the students that didn’t get 100%. They now know exactly what they need to be able to do and they know they have to work to learn it. The increase in motivation is awesome. For younger students, I often provide success criteria for the task at hand rather than long term criteria. One of my favorite activities with my Kinders this year was putting letter tiles in alphabetical order. The success criteria was that I would be able to point to each letter as I sang the alphabet. Being clear led to kids to check their success when they thought they were finished. Kids would point and sing and ask a friend to point and sing. The enthusiasm and joy in their faces as they’d confidently raise their hand and tell me, “I did it! I did it!” was priceless. 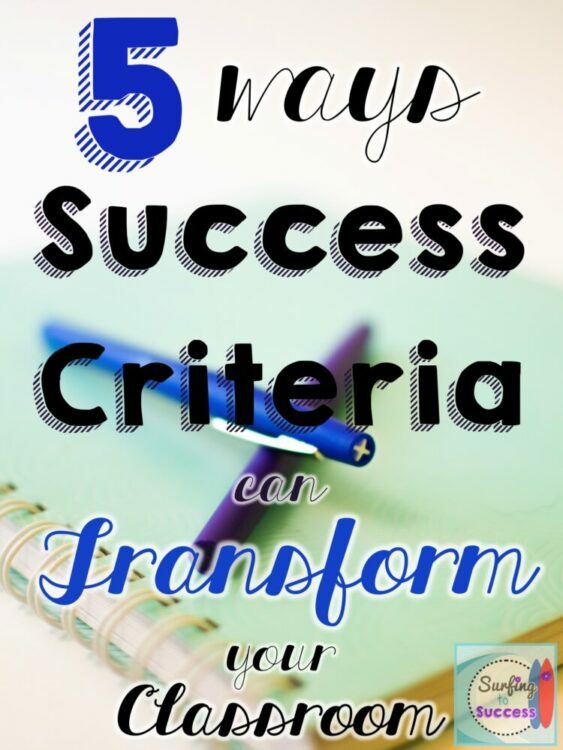 How can Success Criteria Transform your Classroom? Success Criteria Provide Focus to your Lesson Plans. When you know exactly how you want your students to demonstrate their learning, you have clarity about which activities and lessons will get them there. Sometimes we have lessons or activities we’ve been doing for years that have become habit. Knowing where you are going helps you weed out things that aren’t really going to help you achieve your end goal. Providing Success Criteria Helps to Reduce Anxiety. You know that feeling during Professional Development when you are told to start a group task and you realize you have no idea what they want you to do? We don’t want our kids to feel that way. As teachers, we know exactly what it means to be successful when we post an objective. Our students don’t always know though. Whether it is a sample problem, a rubric, or an example of an end product, knowing what success looks like relieves stress. Success Criteria Foster Student Buy-In and Motivation. How many times have you heard a student say, “I already know how to do this?” When you have clear success criteria, and a student who wants to tune out, you can give them an opportunity to prove it. If they are right, they can become a helper or leader or you can differentiate and provide a more challenging objective. If they are given the chance to prove it, and realize they don’t know it all, they suddenly are motivated to learn. I’ve seen this be especially effective with strong willed students with a negative attitude. They don’t want to hear you tell them they need to learn something, but when they self assess and realize they need to learn something, they become more open to listening, working with others, and asking for help. Success Criteria Encourage Self Monitoring. I realized that providing success criteria was transforming my classroom when students began asking to take tests. Students come to me for intervention for a week or two during their Specials time. They are a missing Art, PE, or Computer Lab. So, when students started asking to take the test early, I assumed they just wanted to get back to specials early. What I found, though, was that most students that asked to take a test early, got 100%. They were self monitoring and knew exactly when they had a solid understanding of the concept. A strange thing happened though. They asked if they could stay. They proved they mastered the concept, but they wanted to stay and help the other students. Students that had expressed a disdain for math days earlier were now volunteering to spend extra time in math. Knowing exactly what they needed to be successful led to a self confidence that transformed their attitude. The simplest way to get started using success criteria is to ask yourself what success looks like while you are planning. Then, show your students. This slight shift in planning and teaching can have an incredible impact on your classroom culture and lead to success.